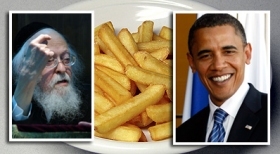 Maran Rav Yosef Shalom Elyashiv was recently asked what the status of French fries is regarding bishul akum. In May, he went to a burger joint called Ray’s Burger. When he asked for fries, he was told that this burger joint does not serve fries. (A burger joint with no fries? Strange). So, Obama at least asked for fries. If you say that this is not enough, and he has to have actually eaten them, then we have another burger run. After consulting with a halachic authority, Matzav.com has learned that it seems clear that Rav Elyashiv indeed did not mean potato chips. The Chazon Ish was the sole authority who was stringent in this regard and considered something to be oleh al shulchan melachim if a king would eat it as a snack in his private quarters. Most poskim disagree and maintain that it has to be served at a royal table, such as at a state dinner, to be given that status. Potato chips would never be served at a royal table. The only shailah concerning potato chips is the fact that since potatoes are served at a royal table, perhaps we look at the min – the general type of food, in this case potatoes – or perhaps we look at the end result, the final product – in this case, potato chips. Most poskim are lenient in this regard. There are other factors concerning potato chips which are further grounds to be lenient, but further elaboration is beyond the scope of this discussion. Contemporary North American poskim who are lenient include Rav Dovid Feinstein, Rav Yisroel Belsky, Rav Shlomo Miller and Rav Moshe Heinemann. Additionally, although a very unclear teshuvah appears in the last volume of Shailos Uteshuvos Igros Moshe, Rav Dovid Feinstein maintains that based on additional factors, his father, Rav Moshe Feinstein, would rule leniently as well. 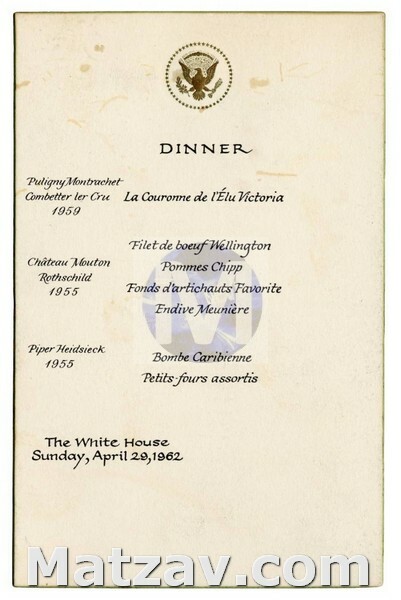 The following is a White House dinner menu below from 1962 with pommes chipp, or French fries. wow you guys at matzav really know how to do it! Shouldn’t the question be: “Would the White House serve French Fries?” What he does on his own is not a standard for Shulchan Melachim – since they will not serve it at a White House banquet. This discussion is ludicrous. There is no way that today’s politicians’ eating habits are comparable to shulchan melachim. Maybe Obama likes an occasional toasted marshmallow, does that make it an important food? Give me a break. first of all they are freedom fries. second, I remember hearing that it doesn’t necessarily go by whether or not he eats them, rather it depends if it would be served at an official dinner (and this may very well be the question which R Elyashiv asked, whether he eats it-at the type of meal which is considered a shulchan melochim). See halacha update . The white house does serve fries. You try putting potato chips on the table in front of the president, watch him go straight for them. first of all its not kovod to put a pic. of Maran shlita together with this rasha named obama. second who cares what obama does a nother president i hear but this guys a low life bum. How can a picture of R’ Elyashiv and lihavdil….be in one picture? What is this world coming to? There is absolutely NOTHING unclear about the psak of R’ Moshe. The only thing it does not say is the reason. R’ Reuvain, to whom it was written, vouches for the psak very addamantly and says that it has nothing to do with following the min, but that he held that they are oleh as is. R’ Yakov Kamenetzky, as quoted in Emes Lyakov, says that they require bishul yisroel due to the min. Regarding the psak of R’ Elyashiv, he has in the past given a similar psak to R’ Koslowitz of Lakewood regarding potato chips. Regarding what constitutes Oleh, most , if not all, major hechsherim do not use the narrowdefinition mentioned. The basis for this is that the poskim clearly say that malochim includes sorim who do not have state dinners. This still may only refer to a more formal setting, but may only be based on the fact that those of the upper caste generally eat better foods. It can be argued that there is no great difference nowadays in America being that most people eat on a higher level. Another basis is this that the Rambam defines it as sheodom mazmin chavero olov. The standard used by the hechsherim is that something which would be served at achasunah or other more formal setting would be considered to be oleh. The menu copy posted is likely irrelevant as thi schanges lfi hamokom vihazman and the fast food establishments seem to have successfully lwered the food. zalman- calm down! I have actually heard this shailah long before Obama was president. I do agree with you that nowadays presidents eat all sorts of foods that kings wouldn’t years ago, but wouldn’t the gadol hador take that into account too? Halacha is not a joke and let’s not behave as if we are smarter than our gedolim. Perhaps Matzav should screen out people who belittle our chachomim. Questioning their motives politely? Not so bad, but to say that a gadol’s statements are ludicrous, why would Matzav want that on their site? why do you assume rav elyashiv would not answer the same way about potato chips ? I believe that the star K asked the White House kitchen if they would serve potato chips. The response was that they would serve plain but not flavored potato chips. potato chips would not be served at a state dinner therefore it is different then frech fries. also rav moshe held that bishul done in factories with different types of utensils is not considered bishul akum. although kashrus organizations only use this heter, as a snif, rav moshe still held that way. 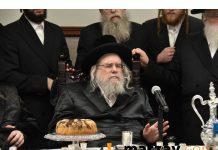 therefore, rav dovid maintains that although is highly unprobable that rav moshe held it is going on the min. but eitherway, he would say that it is muter since it was produced in a factory. Rabbi belsky also has a leanthy eshuvah demonstarting that the whole shail of going after the min is a mistake. the shach quotes a issue vheter. however, if you look up the actual issur vheter – you will notice that the shach did not quote it completely and he had another reason for being machmir on krkevon. you cannot pasken based on a half a line in a shach without looking up sources. rav shlomo miller also holds that it has to be melafes as hapas which it is not. if you want to give a shiur go ahead, but trust me R belsky knows all that you wrote and much more, there is no need to get personal. PS run your comments through a spell check. I hope you are enjoying “Eretz Tzvi”. Thank you for sharing Star-K source. May we be zocheh to “korah alei moad”. 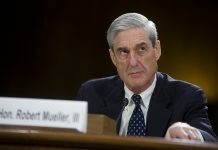 Thanks for the update… Found it interesting,it raises questions about kashrus ingeneral! He definately eats fried chicken and watermelon!!! The shach holds you go with the min ??? ??? ????? what questions does it raise about kashrus in general. Rav Moshe IN THE TSHUVA ABOUT POTATO CHIPS writes not to rely on their being made in a factory. Presumably, this is because they are not made on any specialized equipment, but rather in a large pot full of oil. I discussed Rav Belsky’s tshuva about potato chips with him and pointed out that the Pri Cadash and Aruch Hashulchan cannot be explained to mean the same thing as the Isur vheter. He agreed, but maintained that even according to them they would be permited. The reasoning he used is more of a judgement call and can be debated. A little d. e. please. Do you know who is reading this? You know who is reading this! I’m sure the White House press contingent keeps tabs on all the media – including ours. Not to mention some Yidden who are not yet frum. That means that since all those less-than-eidel remarks are in the public domain, ANYONE could be reading them. Putting anything on the internet is the next best thing – maybe better – to putting up a wall poster in Grand Central Station. There is a perek in Avos (anyone reading that?) which says not to get too chummy with the government, since it only gets chummy with you while you’re useful. I would imagine the same goes for calling government officials names. They’re not likely to look on us with a loving eye when we come asking for something. Why shouldn’t the current administration not pressure Israel, when it knows all the people who support the settlers already hate them anyway, whatever they do? And I think there’s also something in Chazal about respecting the secular government and it’s officials, even if you don’t like them. Disagree, yes. Racist remarks like that of Ehrlich (?!) Yid – no way. Rachel R, Mr.BamaO showed already that toeiva female “reform” “rabbis” are the only Jews that he will deal with.Reform “judaism” has always been more opposed to the (frum)settlers that US State Department. Erlich Yid, he eats this but only bom heim, in his Tiflah on the South Side of Chicago. And thank you, Rachel R, to remind that there is such thing as “Open Source Intelligence” but that people are Soinei Yisroel anyways, and what frei menuyofim/”college students” think, I don’t care.